The cry from TV, big Show Business, small Show Business, School Shows, is for something new, something different. Black Art is a new art to this generation. Dolinoff, Black Theatre of Prague, Ralph Adams, have all been featured on TV, but only these few have practiced this great Black Art. In this ebook you learn all about it, from a do-it-yourself standpoint. There are three complete acts fully described, what to do and how to do it, with details for a modern, portable presentation that can be done anywhere. A modern bar act, a noisy, fascinating spook act, and a children's routine the kids will love. All in Black Art . Be the first to add it to your show - be different! 1st edition 1955; 1st digital edition 2015, 14 pages. This book is a great disappointment. It is called Black Art: a DIY version. It certainly isn't going to help anyone to do it themselves. Actually the authors have a very superficial knowledge of the subject. Also what little information is included is badly out of date. For example while the Black Theatre of Prague are mentioned in the blurb the Black Art technique they employed is never mentioned in the book. Probably the authors never knew about it and so can be excused. But surely the publisher should, if claiming this a DIY booklet, should have made some attempt to bring it up to date. Black Art originally used a totally black stage with all white props and a performer dressed in white. He was assisted in his magic by secret assistants dressed in black velvet costumes, and with black velvet coverings for white props which were to appear. The invisibility of the black on black principle was ensured by the whole proscenium being covered with light bulbs facing the audience, in other words the picture was framed with bright light. These lights were known as "blinders". A later development by the Black Theatre of Prague and other puppet companies was to do away with the "blinders" or illuminated proscenium. They too used black clad assistants and black covers for vanishes and appearances, but the technique was subtly different. Very narrow beamed spotlights were shone across the stage from the wings, creating a side-to-side curtain of light. The black clad assistants stood behind this curtain and pushed anything to become visible into the light from behind. This method of lighting became possible due to the improvement in stage lighting equipment and lenses to control the beam shape and profile. It had the great advantage of allowing coloured props and costumes rather than the all white necessity of the earlier system. Another technique used, sometimes on its own and sometimes additionally, was Black Light. This used Ultra Violet lamps which gave out virtually no visible light, but which made objects or costumes treated with uv paints or dyes glow vividly on an all black stage. 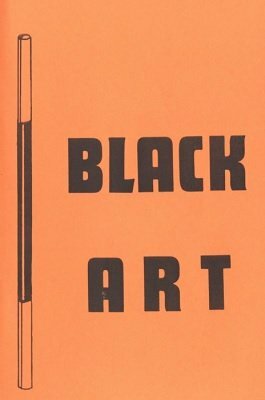 Personally I doubt whether the authors had any personal experience of presenting a Black Art act. I think their ideas are pipe dreams. That is not to say that they are without value ... but the value is slight in that they can only be used if you already have the knowledge that the book fails to deliver.